While I was studying at the Seminary at Andrews University, Deedre and I developed a friendship with a fellow seminarian named Jeanne. She was a kind, fun-loving, affectionate and friendly person. It was hard not to like Jeanne. She was always invited to the Sabbath afternoon potlucks at the homes we were invited too. And it was in these settings that we learned something else that stood out in Jeanne’s character. She was consistently hospitable. As soon as she walked into the home of the person who invited us all over for lunch, she would immediately go into their kitchen and ask what she could get for them and everyone else. She would literally come to your home, put on an apron, go into your kitchen, let you to sit down and relax, while she served you. She did this repeatedly and if she were coming to my home today, she would do the same thing, because she had an unchanging hospitable character. God’s character is unchanging. His character of faithful love is revealed and summarized in the Law of love, commonly known as the 10 Commandments. Therefore the Sabbath commandment cannot be changed. This is beautifully captured in Hebrews chapter 4, where Paul masterfully explains the rest we have in Jesus through continued faith in the gospel as illustrated by the weekly Sabbath rest, both of which remain, as it is says in Hebrews 4:4… “For He has spoken in a certain place of the seventh day in this way: “And God rested on the seventh day from all His works”; then we read this very clear and powerful statement in verse 9… “There remains therefore a rest for the people of God.” Hebrews 4:4, 9 NKJV. His rest remains. It has remained from the early movement of the church taking the gospel to the nations. It has endured the centuries of attack and persecution from within and outside the church. His rest remains even until now, as John describes in Revelation 14:7, a movement of people, Jesus is preparing today, that take the everlasting gospel to the world and call the world to worship Him as Creator, borrowing the exact language from the 4th Commandment… “saying with a loud voice, “Fear God and give glory to Him, for the hour of His judgment has come; and worship Him who made heaven and earth, the sea and springs of water.” Revelation 14:7 NKJV. This is a call, in light of receiving the gospel, to worship God as Creator with your everyday life and a direct allusion to worshipping Him specifically on the seventh day Sabbath according to God’s Law. And since His Law reveals His character of love, which never changes, therefore His Law of love never changes, thus His rest remains. Aren’t you glad to know that God’s love for you never changes? He wants you to experience His unchanging love for you through His gift of rest. It is a rest that remains. It is a rest that He invites you into. 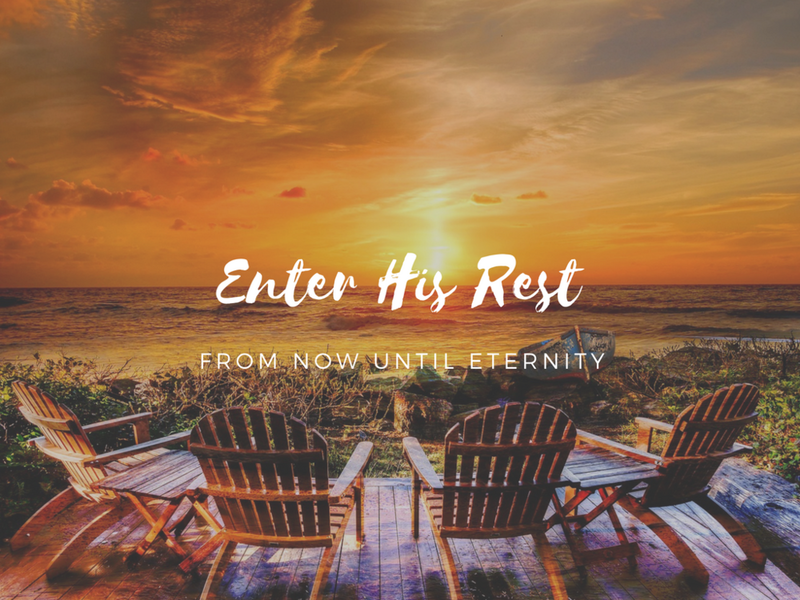 And it is a rest that He wants you to share with the world today by inviting them to rest in Christ through believing the gospel and experiencing the rhythm of the weekly Sabbath rest. Even though life in our world today can often feel like one big mess that threatens to rob us of our peace. God says the story isn’t over. He offers you a rest that remains for you now, no matter what is going on in your life. The Sabbath rest remains from the cross until now as a weekly illustration of the gospel, because God’s sure word foretold it, God preserves it’s witness and God’s character doesn’t change. And how do we know that this rest will continue to remain? Because the Bible says in Revelation 14:12, speaking of those who have entered into His rest, “Here is the patience of the saints; here are those who keep the commandments of God and the faith of Jesus.” Revelation 14:12 NKJV. These are the followers of Jesus who, through faith in the gospel, are resting in Jesus for their salvation and out of love, gratitude for grace and by the Spirit, keep His commandments, including the one that invites us into the weekly experience of Sabbath rest. Watch this next sermon in the series this Nov. 10th at 10:40am. Click this image to watch live.